Cateia Games is probably better known for their colourful, point-and-click adventure, Kaptain Brawe: A Brawe New world, harkening back to LucasArts' The Curse of the Monkey Island series. However, they recently turned their eye to the casual game market, trading exploration and narrative for the touchscreen-friendly puzzle game, Frogs vs. Storks. Your goal is simple, get your frogs over the chessboard swamp without being eaten by storks. However, storks don't actually move by themselves, but perfectly mirror your every movement. Frog moves right, stork moves left. But unlike your frogs, when a stork moves beyond the confines of the screen they magically appear on the opposite side, allowing for many short-sighted moves and even more dead frogs. Strong Points: Colorful animations and backgrounds; fun concept. Weak Points: little variety; frustrating difficulty. Moral Warnings: Many frogs will be eaten. While gameplay remains relatively unchanged throughout, small tweaks slowly create a convoluted game of cat and mouse. 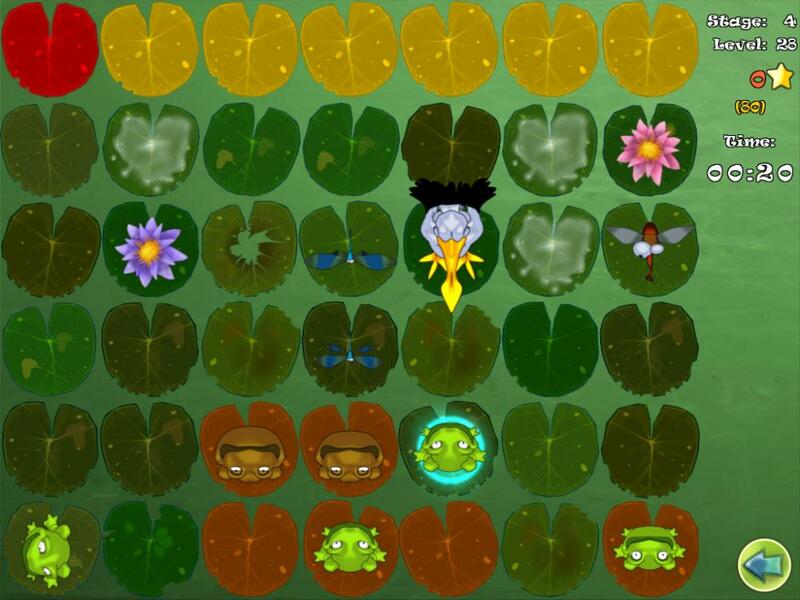 Warp lily pads send frogs and storks to their starting positions, fat frogs need to be pushed to safety, and if you're not careful, storks can also gobble up the flies and mosquitoes, effectively stealing away extra points. 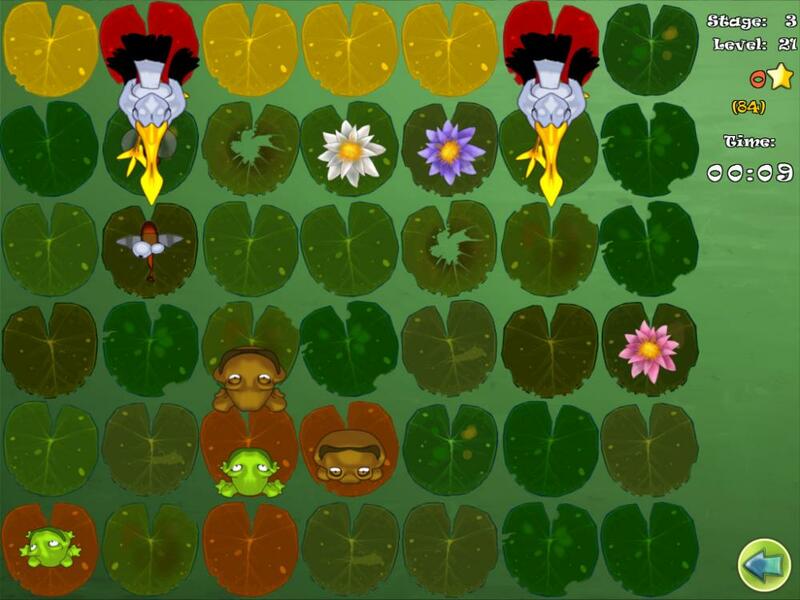 The difficulty ratchets up when multiple storks are added and begin to move two lily pads at a time. After the initial training levels it's easy to feel like you're stuck in checkmate most of the time, making it tricky to move without inadvertently placing a stork on top of a defenceless amphibian. While it's easy to become frustrated on later levels, Cateia Games eases the tension with colorful, cartoon backgrounds and artwork. The animations are subtle, yet charming, no doubt inspired by the Monkey Island games Captain Brawe tries to emulate. Relaxing music and amusing sound effects also help to round out the cartoon atmosphere. The only moral nitpicking one could make is the puff of smoke when a frog is devoured and the disturbing (and ridiculous) concept of a frog eating a stork's eggs for bonus points. In the end, Frogs vs. Storks is a charming diversion, best enjoyed in short bursts. Anything longer and it becomes obvious you're playing the same level over and over. 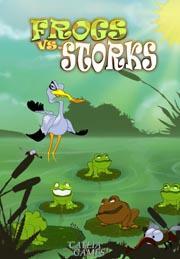 But that shouldn't stop puzzle addicts from taking a break from Angry Birds to give Frogs vs. Storks a try.